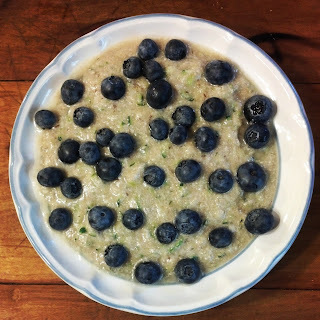 The Cozy Escape: And Here We Jump on the "Zeggs" Bandwagon With Peanut Butter and Blueberry "Zeggs"
So my fellow foodies, or even just my fellow world-dwellers looking for a fast, filling breakfast, here is my recipe for these protein-packed Peanut Butter and Blueberry Zeggs. After doing some heavy-duty research about Zeggs, I commonly kept noticing that many people had very liquidy Zeggs the first time they attempted to make them. To try and prevent a soupy mess, I began this process overnight and realized that it seemed to help greatly in the morning, not only for the texture, but also for the taste. If possible, the night before, shred enough zucchini for a full cup (you can add more if you wish!). Squeeze the zucchini shreds to pull out extra moisture and drain. Salt the zucchini shreds and leave overnight in the fridge - the salt pulls out the moisture. In the morning, pour out any extra liquid; the zucchini shreds are now good to go. Bring water to a boil in a pot on medium or high heat. Once boiling, lower the heat to medium-low and pour in egg whites, stirring constantly (otherwise they will form into compact egg whites!). After the liquid whites turn a nice, milky-white color, add in a ridiculous amount of cinnamon (note: your amount doesn't have to be ridiculous) and oats if you so wish to add them. Continue mixing for about a minute, and then add in zucchini shreds. Once again, you will continue mixing for a while so get that wrist a-workin'! The mixture will slowly begin to thicken. After about a minute or two, add in the peanut butter and flax. Keep stirring for another 2 minutes.﻿ Now, here is where you control whether or not your zeggs are done. I let mine simmer for a little bit, stirring occasionally when the zeggs bubbled, until they became nice and thick and the zucchini shreds "melted" into the egg whites. Once I was happy with the consistency, I poured the zeggs into a bowl, topped with a ton of blueberries, and devoured it up! At first taste, the zeggs were still a little too sweet to me (from the zucchini), so I added a few pinches of salt to taste, and that did the trick! Now it's your turn to take-a-whack at this new pairing in town! I wonder what's next...Toats - tomato oats? It sure has a nice ring to it!